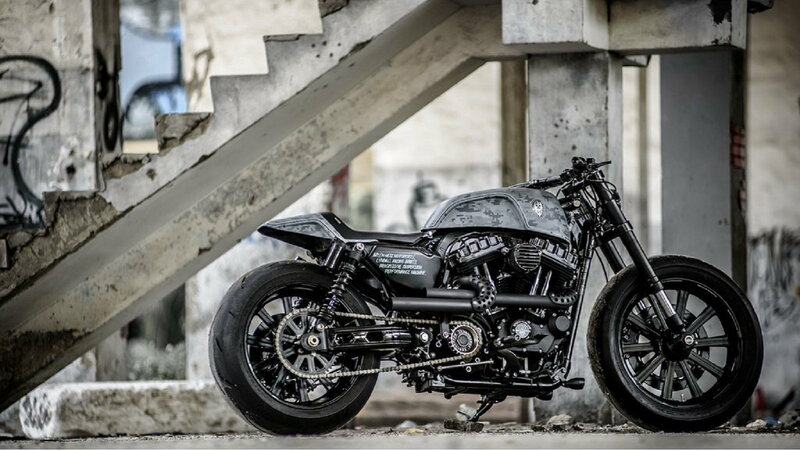 Pretty much every one of Rough Crafts Motorcycles have a dark, sinister spirit built into them and this Sportster Forty-Eight is no different. It's aggressive, dark and looks like it would be right at home sitting alongside a Blackhawk helicopter and surrounded by zombies. 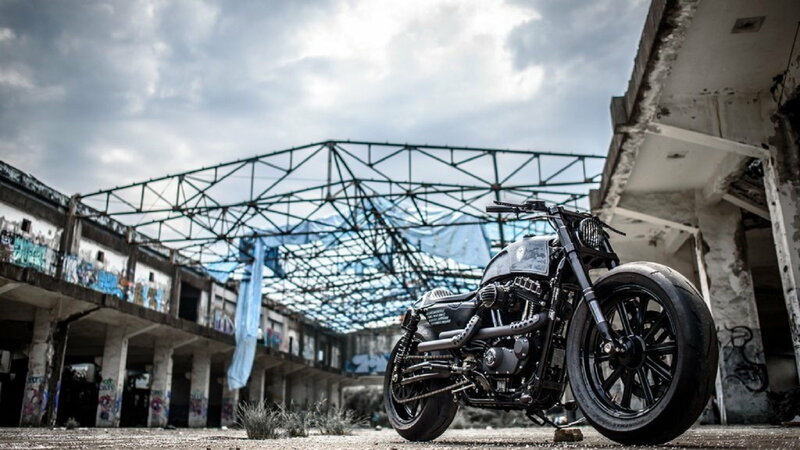 Based in Taipei, Taiwan, Winston Yeh's Rough Crafts customizes motorcycles and builds custom parts and accessories. When Winston builds a custom bike, he then makes and sells the parts that make it special so that any customer can build their own versions of his shop's wicked creations. Every once in a while though...Winston will get a customer in his shop that brings him a bike and say's "do whatever you want to do with it." 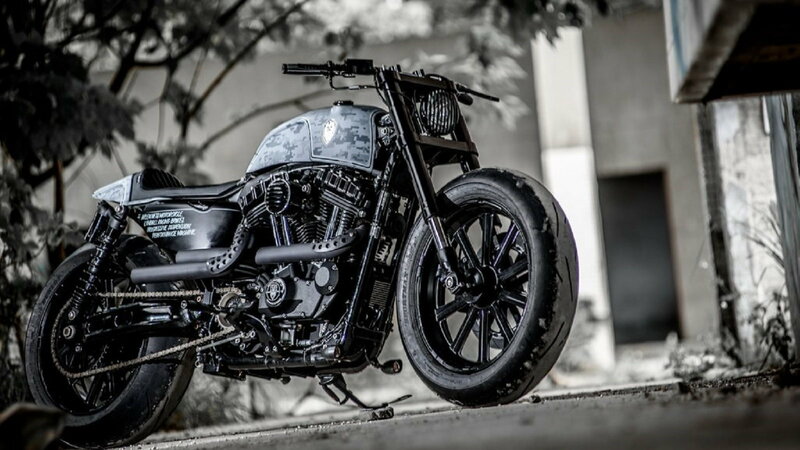 That's exactly what happened with this Sportster Forty-Eight. 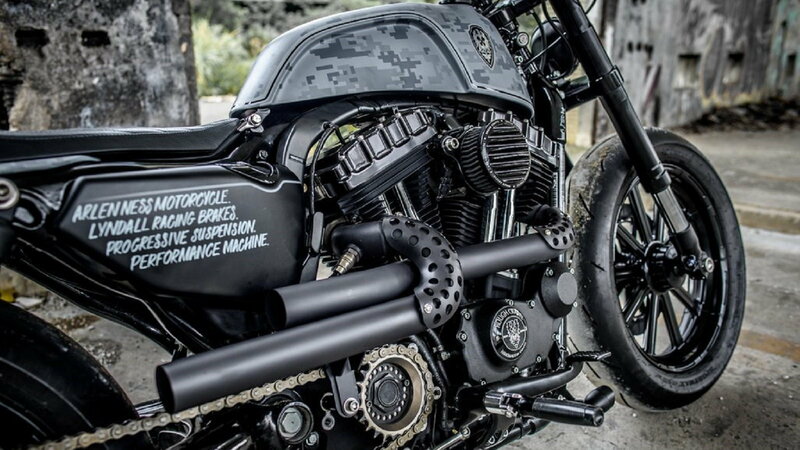 >>Join the conversation about this Rough Craft Forty-Eight in the Harley-Davidson Forum. 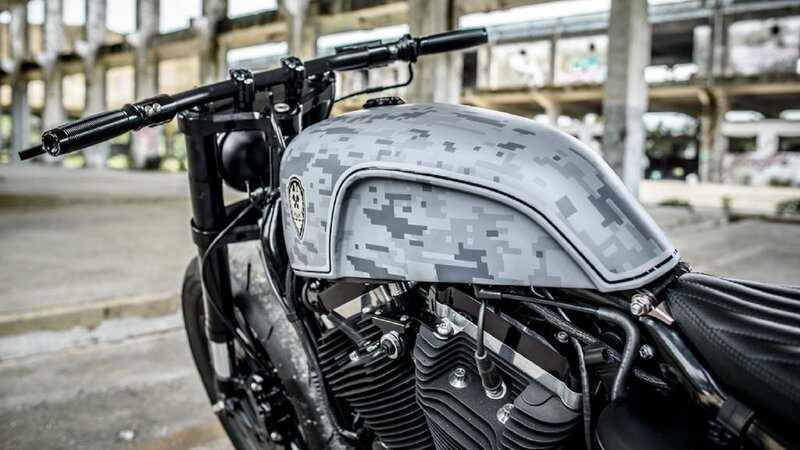 A street-fighter design wearing digital camo just seems appropriate for this bike. It's ominous, no-frills design is fitting of the urban battlefield that is the big city in which it was built. With inverted forks from a Suzuki GSXR600 up front and Progressive piggyback shocks connected to a custom swingarm out back, this bike handles as good as it looks. 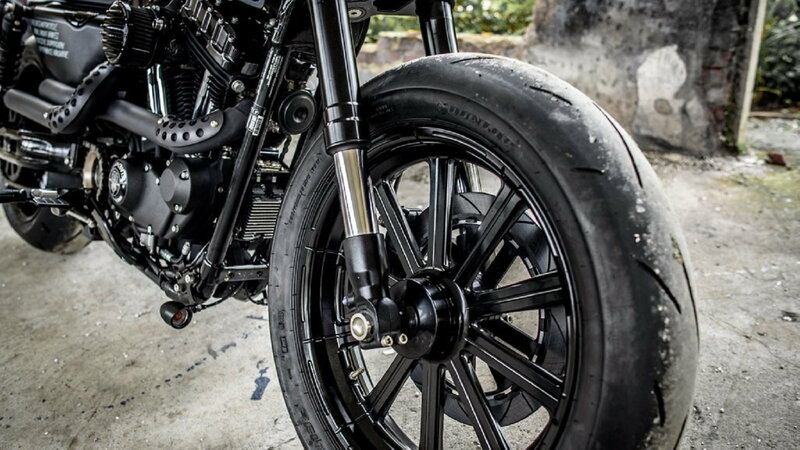 With up-sized Arlen Ness wheels, anodized in black and wrapped in Dunlop Sportmax rubber, matched up with composite rotors from Lyndall Brakes, this bike is more sport than cruiser. Winston wanted a clean look, so he cut the radial caliper mount from the right side, to show more of the wheel. Winston used his signature Guerilla exhaust on this build, along with several other samplings from his collection of hard parts, such as the air cleaner, grips, pegs, timing cover and custom solo seat. Those sick rocker covers are Winston's design as well, as are the low mount front signal lights, grilled headlight, the grooved clutch cover, the risers and the drag bars. As a humble moto-artist, he also gives props to his contributors on the side cover, in true race-inspired style. Keeping the controls clean and uncluttered was achieved with custom grips and risers from Rough Crafts and controls from Performance Machine. The blue-grey digital camo paint on the custom tank was laid down by Air Runner and completed the tactical appearance. As our modern society grows, the urban sprawl takes over more and more of the landscape. As our cities grow to meet modern designs and needs, it's often cheaper to build new, purpose-built structures than to renovate and refurbish existing ones, leaving large, abandoned behemoths of buildings that mock our progress with the reminders of failed or antiquated industries. For some, these scenes make for a dismal riding landscape, but for others like Winston Yeh of Rough Crafts, they are the inspiration for his creations. Not all of us get to enjoy the beauty of rolling hills and ocean side highways or the twisty curves of a tree-covered mountain. No, some riders are confined to the concrete jungle, where the streets are straight, the curves are square and the mountains are made of steel and glass. If you're one of those riders of the urban battlefield, dodging sedans instead of deer, then you may want to check out more of Rough Crafts designs to help you conquer the mean streets of your city. For help with your Harley maintenance and repair projects, please visit our how-to section in the forum.